Plan interventions to correct problems and reach goals. If you’re a practice owner, it’s very likely you’ve read a few articles on preventing burnout in physical therapy, so let’s discuss burnout from a slightly different angle. If you know someone who is displaying signs of burnout, consider this advice: A vacation will not help. When your employee gets back to work, the effects of the vacation will most likely wear off after a few days and the roots of the problem will not have changed. While vacations are an important part of employee physical and mental health, combating burnout is (unfortunately) a little more complicated. Physical therapists are perfectly capable of producing an incredible amount of work and being perfectly happy doing it. After a long day of work it’s also not unusual to exercise, take care of a family, and coach Little League. Even with all this if you look at the data, physical therapy consistently ranks among the top careers in job satisfaction. As a group, we have the tendency to be intrinsically motivated with the daily purpose of helping people, and this propels us through our day. But sometimes it all goes wrong and suddenly what was supposed to be a fulfilling career starts to feel like a stress trap. Let’s take a look at an example of a physical therapist with burnout. In an online post on physicaltherapist.com, a physical therapist reports that after working in an outpatient clinic for just a little over a year he has started to dislike the whole profession of physical therapy. He goes on to mention that his treatments consist mostly of massages and that he is mentally exhausted from listening to people. This particular physical therapist may or may not be a good employee but in any case he summarized quite well the symptoms of burnout. Exploring his complaint we can break his stated problems down to poor treatment regimes and loss of empathy. At some point this employee started feeling obligated to perform massages for most of his patients. Why did this happen? While there is a time and a place for soft tissue mobilization, there are many additional tools in the toolbox that are less repetitive and perhaps less physically demanding interventions. Can you imagine how this worker feels, thinking about how seven years of school was spent to just “rub backs” for a living? Before I started my private practice I was a rehab director for a community health care system. We had a phenomenal therapy gym with every single piece of equipment you could imagine. A therapist I managed there had similar symptoms of burnout, but in this case it was because of an overdependence on using the exercise machines. Instead of feeling like a masseuse, the physical therapist felt like a personal trainer doing the same exercises over and over again. The second symptom and probably the most devastating is the loss of empathy. Once a therapist loses the ability to care about how patients feel, they cannot be happy at work. 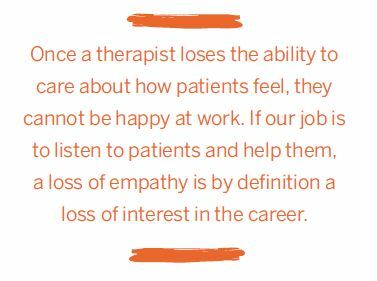 If our job is to listen to patients and help them, a loss of empathy is by definition a loss of interest in the career. If an owner or manager does not act quickly at this stage, the employee more often than not will leave, probably heading for a job in a completely different area of rehabilitation. Managing an employee with burnout is tricky because in my experience it actually involves giving the employee more work. Before you stop reading, give me a moment to explain! Remember I mentioned more work, not necessarily more patients. In the case of the individual who is treating all his patients with massages, an action plan for this employee might involve several continuing education classes or mentoring with another (not burned out) employee. So let’s consider this plan. Will the stressed-out employee embrace an action plan that involves more work? Does this sound a little like the patient with pain you are trying to convince to exercise? How we can break the toxic repetitive work habits? 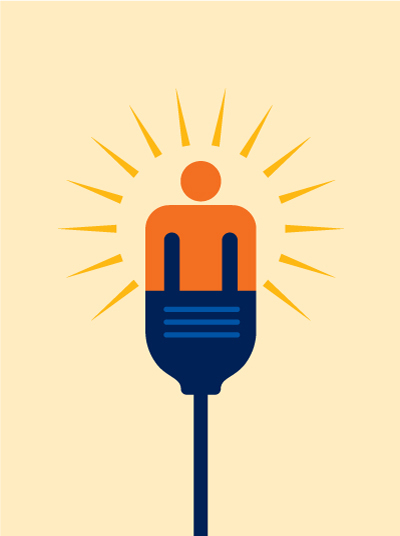 A tool that I have found helpful is to consider the burned-out clinician your patient. I find the subjective-objective-assessment-plan (SOAP) format is a familiar and effective way to begin an action plan. After all, we need to produce an intervention that will change behavior in order to change a problem. What better way to do that than applying to our employees something we do every day for our patients? Your “patient” is your employee referred to your desk with a suspected diagnosis of burnout. After recording relevant work history, you then bring the client in for the first session. As you sit with your team member, the subjective interview begins. You can start by asking how he or she feels about work, stress level, and other job concerns. Ask about goals and ambitions. After the interview you can get objective information by recording what the worker says and does around the office. Other objective information can include a review of his interventions via a chart review. You could also have the employee fill out a job satisfaction survey. Once you have collected all your information, perform your assessment, identify problems, and create a plan of interventions to solve those problems. Plan interventions to correct the problems and reach goals. 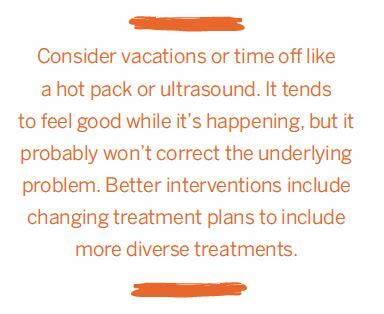 Consider vacations or time off like a hot pack or ultrasound. It tends to feel good while it’s happening, but it probably won’t correct the underlying problem. Better interventions include changing treatment plans to include more diverse treatments. Have the employee mentor another worker. Complete continuing education and have the employee present the class to other staff members. Guide the therapist to implement the new techniques or new program and review the results. Jason Koenigs, PT, is a PPS member and co-owner of Advanced Physical Therapy and Sports Medicine in Marinette, Wisconsin. He can be reached at jkoenigs@advancedptsm.com.